Protesters, including the DisruptJ20 organization, descended on the pro-Trump 'DeploraBall' event Thursday night outside the National Press Club. 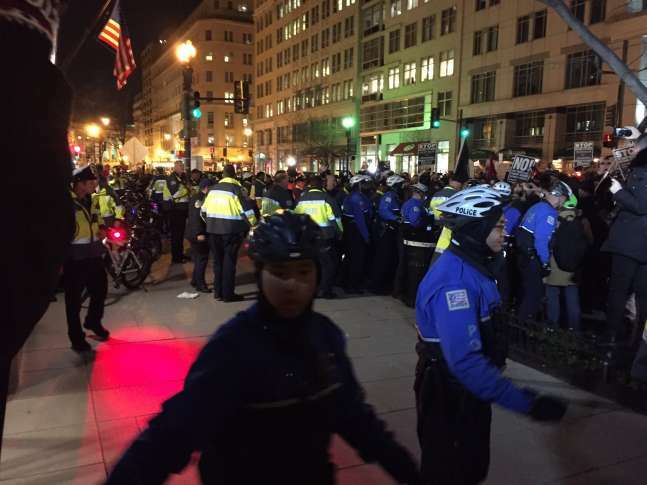 WASHINGTON — Protesters, including the DisruptJ20 organization, descended on the pro-Trump “DeploraBall” event Thursday night outside the National Press Club. A large police presence was on hand, and pepper spray was used on some protesters. An estimated crowd of several hundred gathered outside the club, located near the corner of F and 14th Streets. Police formed a line to keep protestors back — and to clear a path for people going into the ball as protesters hurled insults and chants at them. A few fires were set in the street as well. “We have to be out here saying no, or we will not have any democracy at all if we don’t resist,” said one protester, who had traveled to D.C. from Chicago. A DeploraBall attendee, who had traveled to D.C. from North Carolina, didn’t believe the protesters had anything to worry about.